The Maang Tikka is an integral part of an Indian bride’s ensemble. It is essentially a piece of jewelry that has a hanging ornament at one end and a hair pin at the other. The pin is attached to the hair in such a way that the ornament dangles at the hairline of the woman. This age-old bridal accessory enhances the overall look of the bride and gives her a glamorous yet classy appeal, which sets her apart from the rest. Although, the maang tikka is generally worn by brides, it can also be worn by women of all ages for any special occasion that requires splendor and touch of regalia. 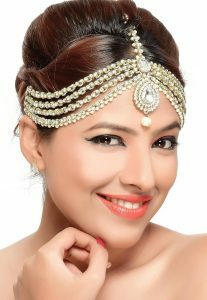 This accessory can be worn with middle parting or any other hairdo. Several Indian ethnic styles are derived from ancient scriptures, or paintings, and the flamboyant design of the maang tikka also finds its roots in historic paintings and artifacts. This hair adornment was worn by men and women in ancient times, and several paintings that have tantric significance depict men and women who wear an ornament similar to the maang tikka on their foreheads. 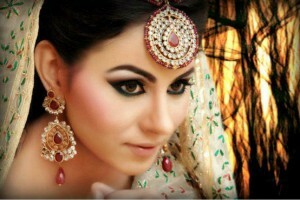 The maang tikka is a prime accessory for brides. It is designed in such a way that it rests on the sixth chakra of the forehead, as told in Hindu mythology and represents the third eye, or the power of the soul. The forehead’s center, where the maang tikka is placed, also signifies one’s ability to control emotions, and the power of concentration. The vintage appeal of this accessory has made it extremely popular, not only in India but across the world. There are quite a few variants of the maang tikka. A bridal maang tikka for instance, has two strings on each side, which can be extended and pinned to the hair, giving a beautiful traditional look. In Rajasthan however, women wear the round-shaped maang tikka, commonly referred to as ‘Bor’, which is a single-string tikka pinned to the hair at the top of the head. Some maang tikka designs are heavy and intricately embellished, whereas some are simple and delicate looking. 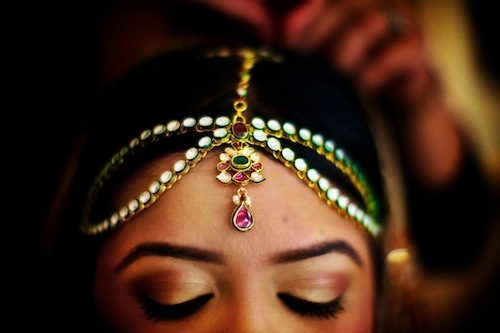 In Muslim weddings, brides wear the maang tikka on one side of the head; and it is known as ‘Jhumar Tikka’. There is no dearth of styles in the fashioning of a maang tikka. Right from a Kundan work tikka to a wrought silver one, the number of varieties available in the market can take one’s breath away. This also makes it possible for women to sport the maang tikka on occasions besides their weddings (a day when only the most elaborate jeweled accessories are required). Apart from adding grace and charm to a bride’s overall look, the maang tikka has been used by several fashion designers in showcasing their ethnic collections. Indian fashion icons like JJ Valaya, Ritu Kumar and Manish Malhotra have flaunted exquisite looking maang tikkas as accessories to some of their bestselling collections. In addition to fashion designers, Indian actresses like Priyanka Chopra, Dia Mirza, and Shilpa Shetty have worn the maang tikka for various fashion shows or for dance sequences in their movies. These days’ women opt for intricately designed maang tikkas, which are made out of precious stones like rubies, diamonds, or sapphires, and are embedded in clusters of pearls. There are various designs available in the market, and one can get a maang tikka according to one’s personal preference. Although an Indian ornament, many women from across the globe have been seen sporting it. For instance, Hollywood singing sensation Alicia Keys was seen wearing a delicate looking maang tikka for red carpet events an accessory to her outfit which primarily featured Western aesthetics. Likewise, several international designer labels like Chanel have used variations of the maang tikka as beautiful head pieces. Indian weddings are extremely popular in the west; and Indian brides generally make it a point to sport traditional Indian outfits and accessories, like the maang tikka, on their special day. This has taken Indian ethnic fashion to regular people from around the world and made it well-liked and admired. A simple maang tikka can be worn for a religious or festive occasion which goes well in sync with gorgeous looking lehengas, sarees or salwar suits. For weddings, engagements, and parties the maang tikka can be donned with opulently designed shararas or women’s sherwanis. Simple looking earrings or studs along with heavy necklaces look best with the maang tikka.